The Kebaya itself has been worn and reinterpreted by women in Asian countries beyond Singapore. Like the Kebaya, other traditional Asian garments also incorporate their own weave of lace and floral embroidery - it’s a rich tapestry that tells the tales of many cultures. These garments are worn by Southeast Asian women of influence great and small: royalty, leaders, cherished mothers, devoted grandmothers and more - the Kebaya is an inherent emblem of personal heroines and the enduring legacies they have created. The intricacy of hand-sewn motifs is translated into the fine craftsmanship of each piece in the Kebaya Collection, reflecting the same devotion to detail with exquisite, handcrafted filigree and lavish arrays of precious gems, made complete with the brand’s hallmark stone: Type A Jadeite. The Kebaya Jade Donut Necklace also reflects the vibrance of a Kebaya, a timeless piece which encapsulates legacies of the past and beyond. 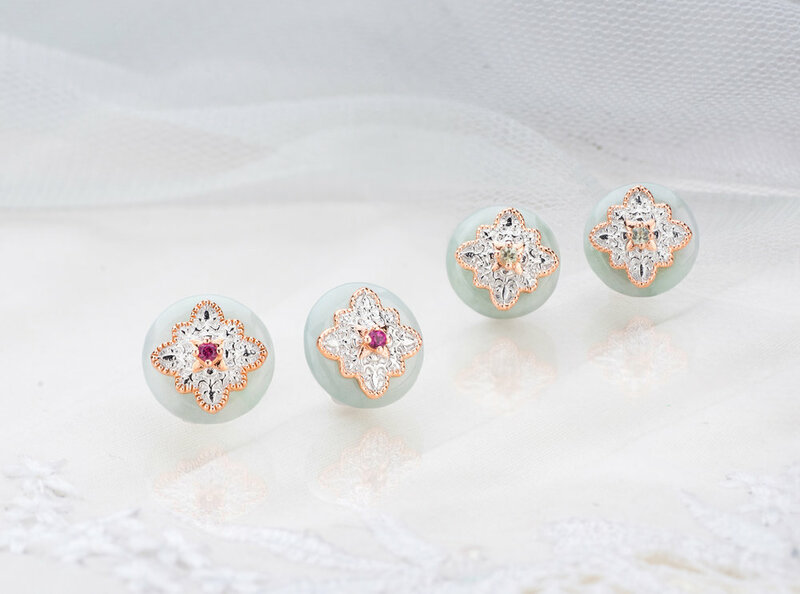 The same motifs are reproduced on the Kebaya Gemstone Rings, which exudes a timeless lavish sophistication. In light of enduring legacies, we had the honour of working with Ethereal by Watabe Wedding through a photoshoot at one of the oldest buildings in Singapore and gazetted National Monument: Alcove at Caldwell House. Caldwell House's neoclassical style design is one of the few surviving works of Singapore's Pioneer Colonial Architect, G.D Coleman. The Alcove at Caldwell House (Level 2) was filled with storied spaces and grand interiors; what rich history must these walls have seen! And what a legacy of romance it continues to hold, as a popular wedding venue. The timeless designs and impeccable lacework of the wedding gowns also had a story to them - Ethereal also pays homage to Asian roots. Their gowns are usually infused with the touch of the orient through the use of fine kimono fabric. Every element of the shoot reinforced our brand's core belief: Important stories must be shared. It's been an incredible journey. It took a full year of research, design, production and development, before we were ready to unveil this Collection and through the process, our team gained many personal treasures through learning more about our cultures, our heritage, and our families. It is with a heart full of love that we launch the Kebaya Collection in our Flagship Boutique and on chooyilin.com. We sincerely hope you embrace the legacies that have shaped you, and realise the legacies you will create to shape the lives of others.